En route to Japan, hubby and I started our journey on American’s 767-300 from Miami to Chicago. We were super excited about the plane, since it has lie-flat seats in first class rather than the standard small, upright cabin. There are seven rows in the first-class cabin, situated in a 1-2-1 layout. Every seat has aisle access, and the middle two seats share an armrest – ideal for couples or friends traveling together. The first-class seat was, by far, the best part of this flight. 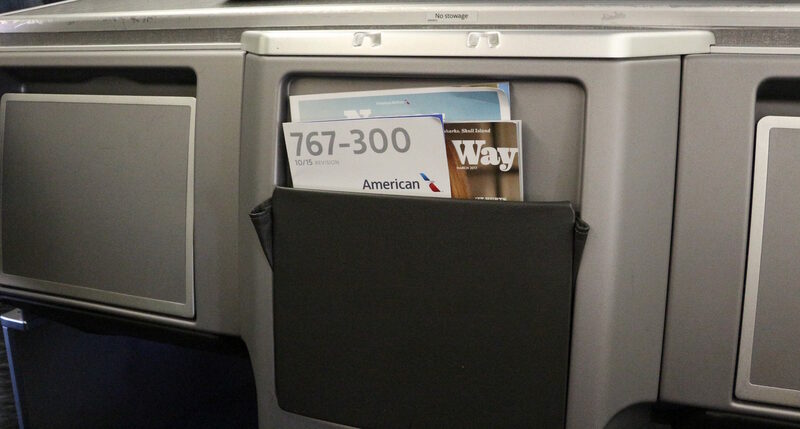 We sat in 2D and 2G – the first pair of seats in the cabin. I immediately noticed an exceptional amount of leg space, which I estimated to be about 18 inches wide and deep. The cubby hole was larger than we’ve seen on even the nicest international flights and even at a tall 6’2”, Josh’s long, lean legs couldn’t reach the cubby hole while sitting up. Major space! The only type of large, gaping hole I’d ever stick my legs into. 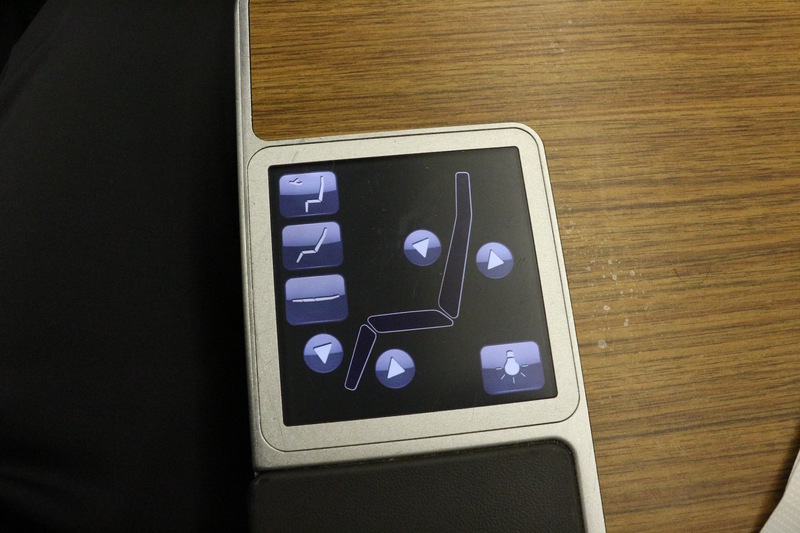 At each seat, there’s a built-in touchscreen that controls your seat settings for recline, footrest and overhead light. Provided are a pair of cheapy headphones, though there’s not really anything to watch or listen to….which brings me to my next point. In flight entertainment. Hope you brought your reading glasses…. Not sure where I read that tablets are handed out to first-class passengers, but I’m telling you now that it’s a total L-I-E-. I brought zero entertainment with me, expecting to catch up on a show or movie when one of the flight attendants told me that there’s not even Wi-Fi on the plane. For such a huge, updated plane on a popular business route, I was maybe most surprised by this – major lost revenue opportunity. AA, get it together. To keep passengers “busy”, there’s a primitive screen between every couple of rows that plays the latest NBC “hit” show. Oh, and you can listen to some random radio stations on the other “channels”. A real splurge. As soon as we boarded the plane, we were offered a choice of drinks – being that it was 8:00 in the morning, we opted for two waters, which were served in regular plastic cups. These were quickly discarded before takeoff, and replaced with real glasses. About 30 minutes later, breakfast was served. The sweet smell of (fresh?) pastries filled the cabin air. I’ll never get tired of free smells! They also served a choice of yogurt and fruit or a breakfast sandwich, which came with cheese and “turkey ham”, whatever that is. 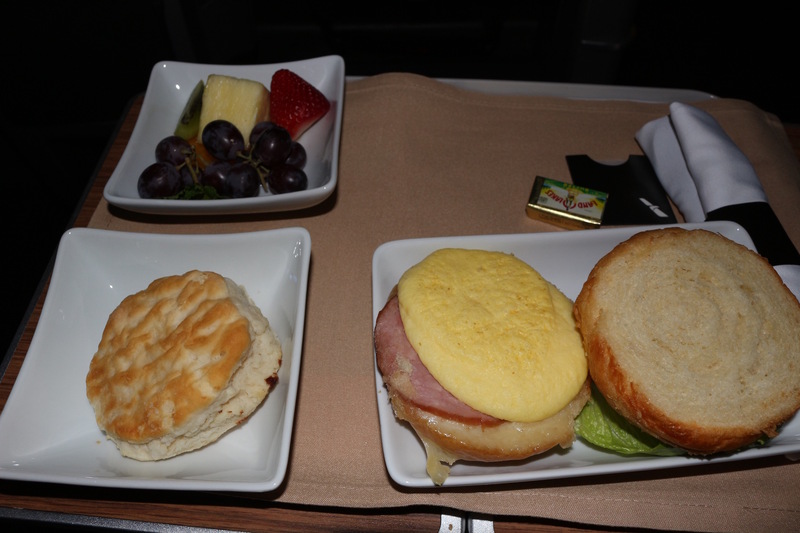 The sandwich was actually delicious – a thin egg patty was served with melted cheese on a flaky croissant bun. There were cherry tomatoes on the plate as garnish, but I used the opportunity to create a TEC (tomato egg and cheese). We also got a small dish of mixed fruit, which came with strawberries, pineapple, kiwi, grapes and an orange slice. 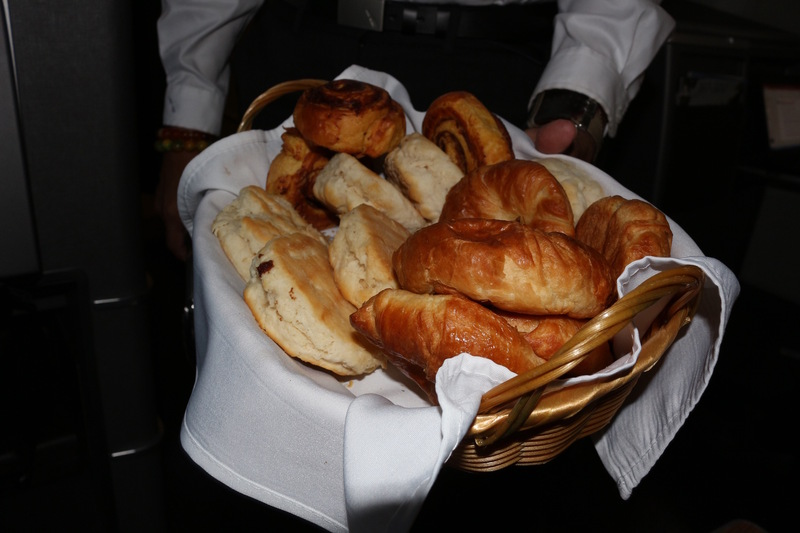 Even though I had a sandwich, they still came around with the basket filled with pastries, biscuits, and croissants. Friends, I can’t think of a time when I would ever turn down a warm biscuit. 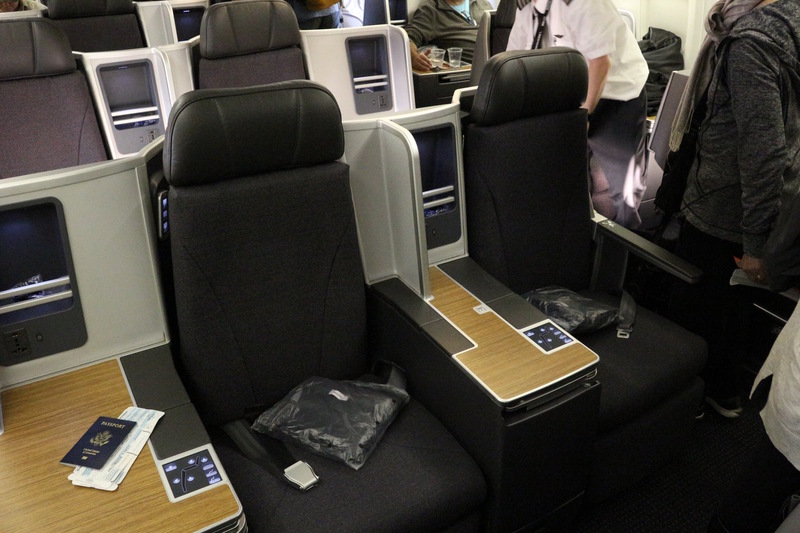 The first-class cabin has two bathrooms on the left side of the plane. 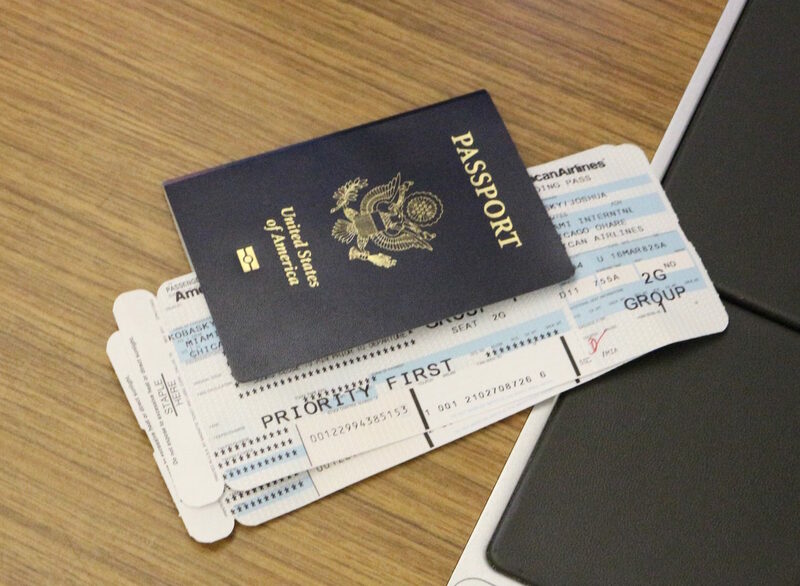 They’re exactly what you’ve seen on other flights, and nothing to write home about. While the flight attendants were generally nice, they didn’t seem particularly happy to be here. There was an awkward moment in the beginning of the flight, when a man accidentally took the wrong first-class seat. Instead of discretely guiding him to the correct seat, they caused a scene which prompted all of us to turn around and see what was happening. Otherwise, they were helpful and attentive throughout the flight and I have no real complaints. 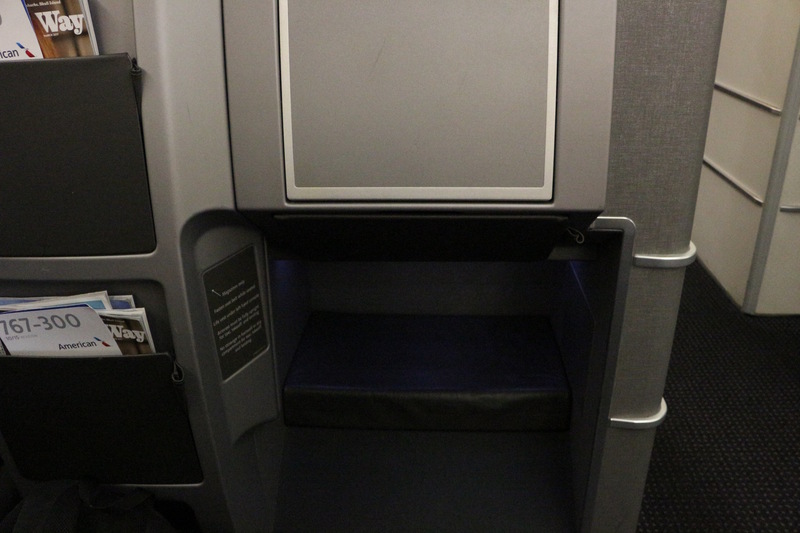 The 767 is a great option if you’re someone who wants to catch some quick zzz’s in first class on a relatively short domestic flight. That said, if you’re traveling for work or even for pleasure, it might not be the best option given the lack of connectivity and entertainment.